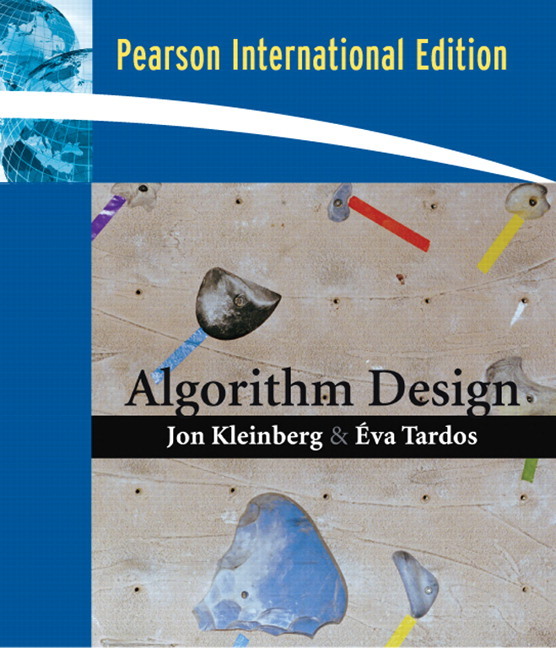 This book grew out of the sequence of algorithms co~ses that we have taught at Cornell. These courses have grown, as the field has grown, over a number of years, and they reflect the influence of the Comell faculty who helped to shape them during this time, including Juris Hartmanis, Monika Henzinger, John Hopcroft, Dexter Kozen, Ronitt Rubinfeld, and Sam Toueg. More generally, we would like to thank al! our colleagues at Corne!l for countless discussions both on the material here and on broader issues about the nature of the field. The course staffs we?ve had in teaching the subject have been tremendously helpful in the formulation of this material. We thank our undergraduate and graduate teaching assistants, Siddharth Alexander, Rie Ando, Elliot Anshelevich, Lars Backstrom, Steve Baker, Ralph Benzinger, John Bicket, Doug Burdick, Mike Connor, Vladimir Dizhoor, Shaddin Doghmi, Alexander Druyan, Bowei Du, Sasha Evfimievski, Ariful Gan~.,_ Vadim Grinshpun, Ara Hayrapetyan, Chris Jeuell, Igor Kats, Omar Khan? Mikhail Kobyakov, Alexei Kopylov, Brian Kulis, Amit Kumar, Yeongwee Lee, Henry Lin, Ashwin Machanavajjhala, Ayan Mandal, Bill McCloskey, Leonid Meyerguz, Evan Moran, Niranjan Nagarajan, Tina Nolte, Travis Ortogero, Martin P~il, Jon Peress, Matt Piotrowski, Joe Polastre, Mike Priscott, Xin Qi, Venu Ramasubramanian, Aditya Rao, David Richardson, Brian Sabino, Rachit Siamwalla, Sebastian Sllgardo, Alex Slivkins, Chaitanya Swamy, Perry Tam, Nadya Travinin, Sergei Vassilvitskii, Matthew Wachs, Tom Wexler, Shan-Leung Maverick Woo, Justin Yang, and Misha Zatsman. Many of them have provided valuable insights, suggestions, and comments on the text. We also thank all the students in these classes who have provided comments and feedback on early drafts of the book over the years.